Winter engagement sessions are quickly becoming a new favorite thing of mine. Winter in Minneapolis is long and cold but a huge part of daily life so why not just embrace it. It provides the perfect backdrop for some cozy engagement photos and all the more reason for coffee and sweaters. 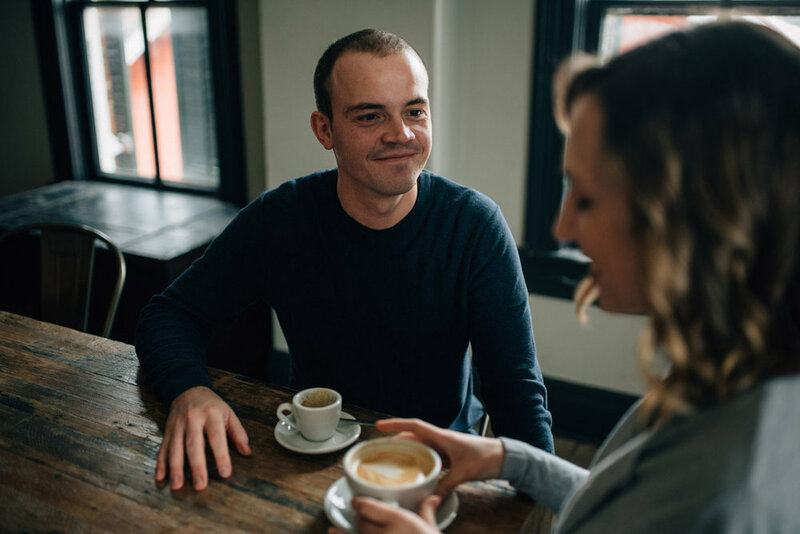 I first met Kevin and Rachel over coffee in St. Paul so it felt fitting to do engagement photos in a coffee shop. They have know each other since high school (yay high school sweethearts ;) )They are both so laid back and comfortable with each other. Nothing feels forced or inauthentic about their relationship. I love that they let me into their world for photos and I'm looking forward to their Spring wedding at Gale Wood Farms!